The last month has involved a lot of building the scaffolding required for a large project. The unsexy code that allows you to build things quickly in the future. Core services - debug displays, logging, state save & load, program execution playback; and basic tasks - data structures, juggling between CPU & GPU, job systems for organising work, etc. It's the work of not starting out with an existing engine and only some of it can be avoided by looking into the ecosystem for Rust and picking out the crates that best satisfy my requirements. The benefit of getting this stuff done in Rust is that I'm not too worried about my threaded code, and I'm getting used to the details of the language and compiler tools before I start any heavy experimenting or profiling to optimise what I'm building. There is always a period of getting up to speed and sometimes you can overlap it with doing the basic code that often is more about getting plans down than doing anything novel or particularly complex. I've been playing quite a bit of Mashinky recently, which is an early release of what could turn into a pretty exciting spin on the TTD model. A seven year solo development project is being brought together for a final landing and it's interesting to see such a clear vision which hopefully this team (presumably paid via the Early Access monetisation of the final part of development) will be able to polish off. It's good to find inspiration in the work of others, especially when you're building something that has yet to really create anything worth showing off. The real party trick in this game right now is flipping between a stylised orthographic (polygonal) projection and a more modern and realistic perspective projection. You build on the classic grid but can flip back to enjoy the scenery at any point. It's a good way of providing both the underlying details you need to construct line extensions and offer a visually interesting view into the virtual world you're shaping. Speaking of scaffolding, the Early Access version is very much incomplete and, between the features that are completely missing, what is here does feel a lot like it is scaffolding for a pretty engaging problem engine (as most builder games are, for example Cities Skylines lives on the traffic problem engine that drives many of the decisions you have to make). 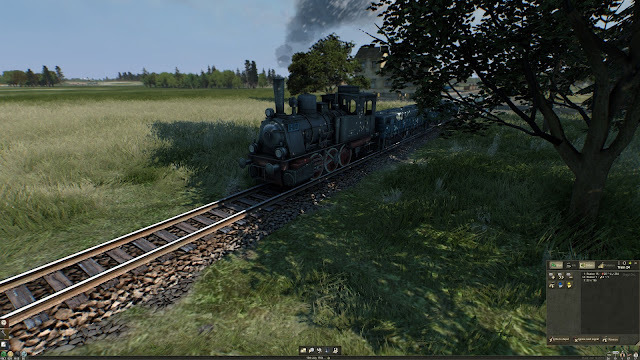 In the case of this Mashinky alpha, it provides the template for dynamic and authored quests along with three eras of technology that slowly advance the available equipment and the sites of resource creation and processing. An interesting decision is to cost lots of the technology and upgrades in resource tokens. You deliver felled trees to be processed into planks but then need those to be delivered to the workshop before you get lumber tokens to spend on better rolling stock (and all these locations are randomly populated based on the map seed). Almost everything is extended throughout the game so expect all of those locations to also be heavily upgraded (again, using a mix of token types) as you progress. But there are plenty more eras not in the game and the quest system is extremely light in what it offers you. If you want to build train tracks and work a slowly deepening optimisation problem of moving resources around randomly generated locations then you're ready to go. But Mashinky right now is very clearly only showing us the hints of a potentially great game. It is exactly the type of game that has previously done very well being refined in public for a couple of years before hitting a 1.0 release. There are always going to be lots of quality of life ideas that a small community can quickly highlight. Right now I would really enjoy being able to disable production buildings as they build up to having lots of different production lines which all have different efficiencies and production output (especially with the current way around this being to destroy extensions if you really want to turn them off). Right now a big scenario builder update is the next thing coming, which I can see the point of (vs the current random generation only maps), but I'm at the point where I'll probably wait a while before some major updates (like a new era or two) arrive before jumping back in. With 30 hours already logged on Steam, it has already been plenty of fun. By the time it leaves Early Access, it could be something to recommend to anyone who finds Factorio too daunting or violent.